Map 1.1 provides a quick glance at global maternal indicators to help you view the latest evidence. Click on the countries to view key indicators and their statistics. 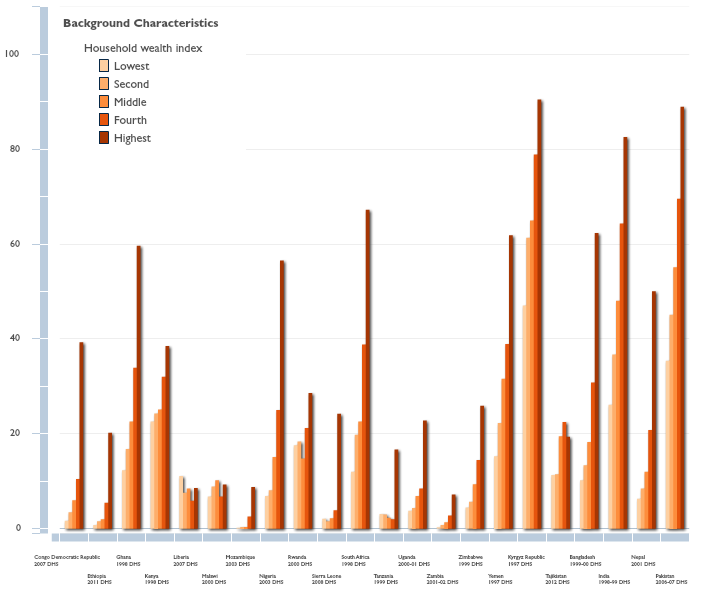 Use the play button to view trends in indicators over time (between 2005 and 2013). Compare the figures across different nations and regions. Where are the gaps in the data availability? What comparisons can you see between countries? How does your country of residence compare? Map 1.2 is a quick glance at global newborn and child health indicators to help you access the latest data. Adolescent girls are a specific group to consider. Although there is a variation in fertility rates among adolescents, prevention of pregnancy is of key importance because they are at a higher risk of complications and death than older women. However, if pregnancy does occur during adolescence, special needs have to be considered and the risks associated mean that antenatal care and skilled attendance at birth is crucial. Check your knowledge: What are the specific challenges related to providing MNH services to adolescents and therefore what different approaches are required first to reduce the number of adolescent pregnancies and then to ensure pregnant adolescents are able to access safe ANC and use a skilled attendant for delivery and post-natal care? Adolescent girls have a much higher risk of mortality than older women and represent 10% of the overall maternal mortality rate (Nove et al, 2014). Adolescents often do not feel comfortable attending routine services for many reasons including stigma, the attitudes of health professionals and the unsuitability of opening hours if they are at school or working. Therefore the provision of services needs to be youth-friendly i.e. adapted to the needs of this group. Preventing adolescent pregnancy should be the first strategy, prioritising education through media and social networks and providing subsidised family planning (FP) services at more appropriate times (which often means working through the private sector and less traditional and more youth friendly partners). Similar issues need to be considered so that pregnant adolescents can attend routine antenatal care and delivery – innovative strategies are required to deliver appropriate and effective quality services for adolescents. The above interactive maps highlight the range of different indicators available to measure MNH for all women and for younger women who have special needs. Timely access to health services by women during pregnancy, delivery and the puerperium period is important should complications occur. This could be influenced by several aspects of access to health care, such as affordability, availability, geographical location and acceptability of the health service. There is evidence that access to health care is not equitably distributed in many low and middle income countries. Figure 1.4 shows the median levels of various types of health care use across 47 to 55 low and middle income countries, among population quintiles within countries. Figure 1.4: Median levels of health care use across 47 to 55 low- and middle-income countries (number of countries varies according to data availability for the four types of health care use), among population quintiles within countries. Data sources: Houweling, T and Kunst, A. 2010. Take a closer look: What is striking about inequalities in access to services? 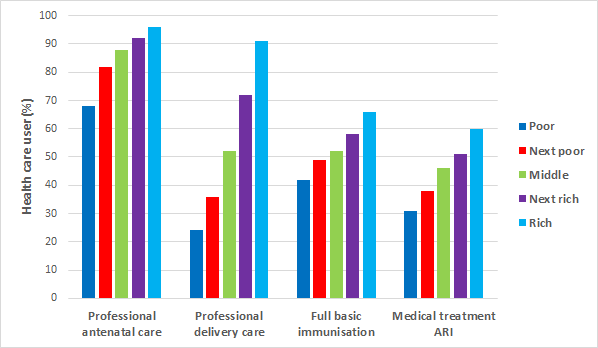 Although the poor have the lowest access to all services in this graph, Figure 1.4 shows that the greatest difference is between rich and poor accessing professional delivery compared to antenatal care (even when compared with other health MNH services not shown in this graph). Question for reflection: What implications should inequality of access have on practice? To design an effective programme we need to first understand the constraints for poor women accessing MNCH services and then understand why women are choosing to attend ANC but not to use a professional birth attendant. What will be needed in your country or specific context to increase use of MNCH services by poor women? As mentioned before, the demographic and health surveys (DHS) have amassed a wealth of country level data at across a range of indicators. The latest version of the interactive Statcompiler tool provides an opportunity to explore this data. Figure 1.5 below provides an example. It presents access to antenatal care provided by a doctor, disaggregated by household wealth in the DFID focus countries where DHS data is available. Figure 1.5: Access to antenatal care provided by a doctor, disaggregated by household wealth in the DfID focus countries where data is available. Click the chart to view trends in antenatal care by a doctor, to configure how the data is displayed, and to browse the full range of indicators available. Consider your own context: What does the data for the location(s) relevant to you reveal? Explore the data made available by the statcompiler tool for specific countries most relevant to your work. In doing so you should be able to identify (or be reminded of) the key challenges that the data reveals, but also any gaps in the gathering and sharing of data. How does the data reflect DFID’s current priorities and what does it suggest should happen in future? Next we will turn to looking at some data on trends and causes of death.